As a “Gaslamp Fantasy” and Steampunk-themed area, Steelhead has it’s share of odd characters. The area with everything from residential living to roleplays to shopping or just intellectual discussions bills itself as “in addition to cowboys, is home to Moon Elves, a woman who's half cat, mad scientists and crazed inventors, a werewolf sheriff....and that's just the city council members." There are other characters at Steelhead. Baron Klaus Wulfenbach, made famous in the online comic “Girl Genius,” is often to be seen there (though who knows how he gets to and back from Europe so fast). Not all are so easily seen though, some being a little shy. Among them, Steelhead’s resident Bigfoot, or Sasquatch as they call him. I took a couple pictures of the Sasquatch, though with a camera resembling what the locals use to avoid too many questions. While it worked, the flash did cause him to rub his eyes a bit. Mindy continued, “It's so good to see you, Mr. Squash. I missed you. I put a Christmas tree in your cave and I wroted to Santa for you to ask him to bring you a present, too.” The Sasquatch scratched his head, “Santa...... ?” “Santa Claus! I heared about him. He brings presents to people on the Nice list. So, I fixed my house alll up to meet him. He flies a sleigh that's pulled by flying reindeer and they land on the roof.... so I put a landing strip up there!” Apparently, she had been trying to explain Christmas to him. 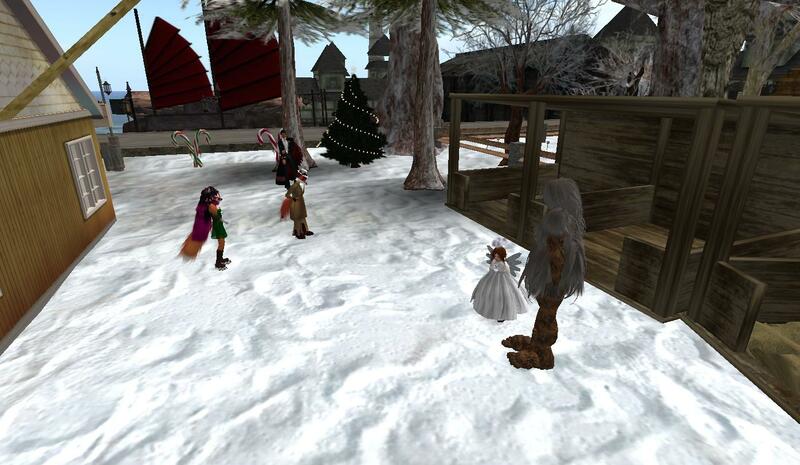 We were joined by a tourist to Steelhead, Rua Whitepaw, as well as Sheriff Fuzzball Ortega. “My Marshal! It is our town hero!” Mindy exclaimed. The sheriff greeted all of us, “Hello, everyone.” He glanced up at the roof, “You weren't kidding about the landing area, Mindy.” Mindy beamed, “Look! I am an angel for the Christmas reading.” Then her attention went to what the sheriff noticed, “I don't want Santa to miss me on his first visit. I would be sad. ... I gots a beacon 64 meters tall! I think he will find me. I hope.” Fuzzball looked at it again, “I think folks on the other side of Caledon'll be able to find you.” Mindy giggled. When I asked Mindy how did she and the Sasquatch meet, she answered, “He walked into the town meeting and I went to say hullo!” Asking how he learned English, “I dunno. We just talked, didn't we, Mr. Squash?” “Yah. Talk talk talk talk talk. Learn talk good.” “I did lots of talking and he did lots of listening.” Rua suggested a dictionary might help Sasquatch, if he could read. He just answered, “Mindy reads. Squatch lissen.” Mindy told that Sasquatch had been walking over to the town school. Apparently it was okay with the teacher as he just quietly listened with the pupils. Mindy then offered to show where the Sasquatch lived. The sheriff didn’t have a problem, but wanted to keep an eye out. The rest of us traveled to a spot in the woods near Steelhead where there was a small cave. In the back of the cave was some hay, Mindy saying, “I makes sure the hay is fresh just like I do for the stable. And I even sleeps here sometimes in the summer when Mr. Squash is gone” Near the cave’s entrance was a small, simple, Christmas tree. Mindy told, “I made sure there was once here for Santa to leave a present.” “Yah, christmas tree. Not bathroom tree. Over there bathroom tree. You use. It good.” “That's right. If you have a pretty tree with decorations, then it is not a bathroom tree.” I asked Sasquatch what he thought of human beds. He answered, “Is good. Sasquatch leave hair all over bed. Missus Riven say ‘Get out hairball.’ " Mindy told she usually slept on the rug at her house with her pet Meeroos. After a few more words, we parted ways, and the Sasquatch went about his business of the simple life in the woods, the rest of us our busy lives in our respective communities.